Avraham ben David (1125-1198) also known as the “RaAVaD” (a title derived from the initials of his name, as is common with many Jewish sages) was one of the greatest scholars in history. Born in Provence, France, the Raavad was the chief rabbi of Montpellier and Nimes (where Denim fabric, “De Nimes” was invented). During his tenure as the head of the yeshiva, Nimes gained a reputation as one of the greatest places of Jewish learning in the world. Rabbi Avraham spent most of his life in Posquieres. He was incredibly wealthy, financing the construction of schools with his own funds, and supporting the poor. Because of this, he was once imprisoned by the lord of Posquieres, before a count who knew of the Raavad’s greatness freed him and banished the lord. The Raavad wrote hundreds of different works, including a penetrating commentary on the entire Talmud. More importantly, he is often regarded as the “father of Kabbalah”, revealing ancient Jewish mystical teachings and clearly elucidating them. 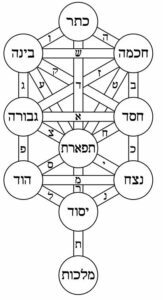 The famous diagram of the mystical Sefirot arranged in a “Tree of Life” is attributed to him. The Raavad was also a noted astronomer, philologist, and philosopher. Spanish government records reveal that his descendants were important advisers to the Spanish monarchy. Meticulous in his analysis, highly critical, and opposed to dogma, he was a man that cared only for Truth. His impact on the depository of Jewish wisdom, and on the Jewish people, is unparalleled. Because each life form, even fruit, is entrusted to a specific angel. By saying a blessing over a fruit, we empower that angel to reproduce more of that fruit. One who refrains from partaking of a fruit deprives the world of the spiritual influence that the blessing would have provided. This entry was posted in Religious Leaders, Writers & Thinkers and tagged Abraham ben David, Avraham ben David, Denim, France, French Jews, Kabbalah, Purim Katan, Raavad, Rabbi, Sephardic Jews, Spain, Spanish Jews, Talmud, The Raavad, Yeshiva on February 17, 2011 by Jew of the Week. Today (Kislev 26) is the Raavad’s yahrzeit!